Marc has set the bar really high for BM clones. The Skreddy Ernie is farking amazing. It seems to be beyond what I thought a Big Muff could be. PS: I traced the schematic and took the pictures a long time ago, but I never wanted to make them public for respect to Marc Ahlfs as I think he is doing a great job. I happened to give the schematic to ech0es and he posted it. Now that the Mayo ain't in sale anymore, I can post the gut shots without doing any harm to Marc (I hope so). Omar Bagh Dad-A wrote: :secret: The Skreddy Ernie is farking amazing. It seems to be beyond what I thought a Big Muff could be. So is the Zero ! Thanks for the package zero! if i'm allowed to say so. Same layout. Transistors are 2N5088 (NOS circa 1980?). All original "triangle knob" specs otherwise, except that the input cap is a .1uf tropical fish, the coupling cap between stage 2 and 3 is also a tropical fish .1 (and there's that 100uf power-supply filter and polarity diode and tbp and led). thx marc! you are very kind!!! Skreddy wrote: Seen any of these? Where were you when I tossed a load of these about a year ago? Anyone have a bunch with gains ranging from 600 to 800 for sale? I like 'em. sorry for butting in here but transistor's on my rams head clone, I've used 4 old can bc109's that all measure between 350 and 370, i notice that ur asking for 600 - 800, interesting how would that affect the sound? ....interesting how would that affect the sound? that´s a real good question since in every gain stage is current AND voltage feedback..... AND the gain of each stage is far below the ß of every si-transistor. 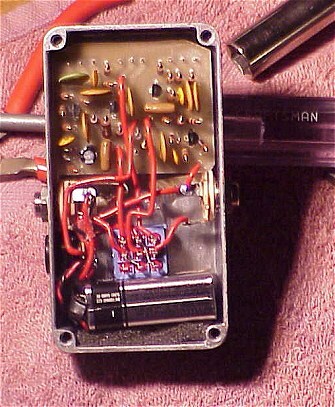 alteredsounds wrote: sorry for butting in here but transistor's on my rams head clone, I've used 4 old can bc109's that all measure between 350 and 370, i notice that ur asking for 600 - 800, interesting how would that affect the sound? Higher gain transistors result in a more "biting" sound (more aggressive attack, more sensitivity to high frequencies, boosted mids/upper mids content), all other things being equal, in the BMP. Lower hfe's render a mellower sound, more natural attack, a bit darker response, all other things being equal. But the nature of the transistors themselves, owing to the maker, the process, the materials, etc., is more significant usually than the gains. E.g. ; old, circa 1970, 2N5133's with gains in the 500's sound smoother, creamier, more dynamic, and sweeter than newer versions of the same with gains in the 300's. Certainly all the nice biasing and feedback built into the gain stages of the BMP ensure that nearly any BJT will work; but that doesn't mean they'll all sound alike. Thanks, I'm gonna throw a load of different ones at it over the w/e, see what I come up with. Great zip file! Thanks Zero (the Hero). Big thanks to Skreddy for sharing your hard work. "Fuzz" movie I just bought. You never appear as self absorbed as some of the other interviewed builders. making a vero layout thought me a lot. - why a higher collector voltage on Q2? - why split the collector resistor on Q4 in 2 resistors with the output at their joint? - i guess the 47pF after the tone section filters some highs? i love the sound of my clone A LOT!